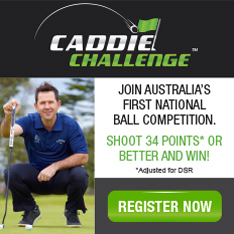 Shelly Beach Golf Club is a proud member of Caddie Challenge, Australia’s first national ball competition. SHOOT 34 POINTS* OR BETTER AND WIN. COMPETE ONLY AGAINST YOURSELF AND THE GOLF COURSE. Register online and deposit a minimum of $20 via credit card to your Caddie Challenge account. Accept either a $5 or a $10 Caddie Challenge entry fee. Your Caddie Challenge must be Accepted prior to 6.00am the day of your competition round. Play in a competition round of golf and Caddie Challenge will do the rest. Our system is fully intergrated with Golf Link, so most scores will be updated in the evening of the day you play. All prizes that are won by participating Shelly Beach Golf Club members are redeemed in the form of credit on their Shelly Beach Golf Club membership card to be spent at either the bar, restaurant or Golf Shop. So by playing Caddie Challenge you are rewarded for playing good golf and you are supporting your golf club. Start winning now and you could shout your friends!